'Etihad Stadium following its dismasting in Bass Strait en route to Sydney for the Boxing Day start of the 2009 Rolex Sydney Hobart' Etihad Stadium - The are now working on getting a replacement mast for the boat. 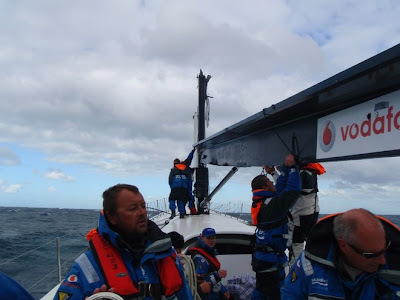 Former Volvo Ocean Race skipper Grant Wharington is battling against the clock to make the start line for the Rolex Sydney-Hobart later this month after his 98ft supermaxi Etihad Stadium lost its rig during delivery to Sydney. The incident occurred with the boat making 25 knots downwind in Bass Strait. The mast was broken five metres above the deck. Currently shore crew members are in New Zealand to oversee the re-build of a replacement mast which has been sourced from the south of France. The logistics of getting it to Sydney in time for the race start on December 26 is the biggest challenge. "I'm quietly confident that we'll have a transport solution from options that have been offered over the last 48 hours," Wharington said. "As soon as the mast is in the air en route to Australia, we can get much more confident about our chances of competing in the Sydney-Hobart." The boat is now waiting at Noakes, in North Sydney, where a small number of crew will also be based for the next few days. The replacement mast belongs to rival Alfa Romeo and engineers are determining how it can be adapted to the Etihad Stadium layout. "There are no insurmountable problems with the use of the replacement mast at this stage," Wharington said. "Our next challenge however, is the transport, and we have a few people working on some possible solutions to that problem. We have some very tight timelines should we be able to go ahead with installing the replacement mast." Wharington led an Australian entry in the 2005-06 Volvo. The modified first generation Volvo Open 70 - Ichi Ban - will be on the start line in Sydney and has Volvo sailors Tom Braidwood and Andy Meiklejohn among its ranks. Wharington had has mixed results in the Sydney-Hobart. Etihad Stadium, formerly Wild Thing, took line honours in 2003 before losing her canting keel and capsizing the following year. The Don Jones-designed maxi was rebuilt and finished second to Wild Oats in 2008.